An Obamacare book like no other, OBAMACARE: HEALTHCARE APOCALYPSE not only lays out all of the core components of the Patient Protection and Affordable Care Act for readers, but also provides a detailed analysis of the long-term impacts this massive federal intrusion into healthcare will bring forth. Whether by intentional design or as the byproduct of bad law, Miller writes that Obamacare will tax the current predominantly employment-based third-party payor system to the breaking point, which will pave the way for full-scale government intervention in the form of socialized medicine. Obamacare will accomplish this feat under the guise of consumer protections. 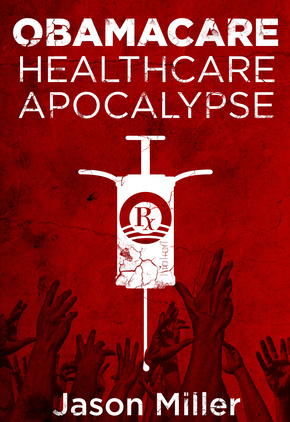 In OBAMACARE: HEALTHCARE APOCALYPSE, Miller brings to light that the real impact of Obamacare will be felt slowly over time as a series of delayed-implementation “time bombs” that will erupt with damaging consequences. Jason Miller is a health law attorney who writes extensively on an array of healthcare issues, with particular emphasis on the Patient Protection and Affordable Care Act. His writing has appeared in The Washington Times, Medscape Journal of Medicine, Modern Healthcare, Pennsylvania Outdoor News, and The Lawyers Journal. Miller received his law degree from the University of Pittsburgh School of Law with a certificate in health law. This entry was posted in Nonfiction, Politics / Current Events and tagged Apocalypse, Conservative, Healthcare, Jason Miller, Nonfiction, Obamacare, Politics, PPACA.